Are you a collector who is content having one replica of a building? Or, do you want to own every possible version of a souvenir building? Every different size, every different color, every different…anything. If different makers produced a replica at different times, do you need each one of these too? Admit it, you know who you are. Some versions are rare, while others can be more common. Microcosms made a few finishes for their building replicas including a pewter and copper-colored Griffith Observatory in Los Angeles. Banthrico produced the Lawn Savings Bank in both copper and gold tones. One version of the Bankers Life Company bank in Des Moines, Iowa has raised lettering on its base and an elongated trap on the bottom, while another version has concave lettering and a smaller, square trap. There may be yet a third slight variation of this building as well. 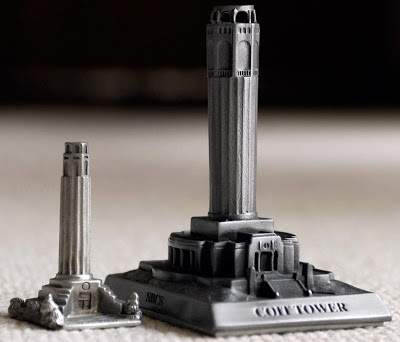 The Coit Tower was made as a small pewter version and then a larger SBCS convention commemorative. Replicas of Fort Dearborn in Chicago was made in different painted finishes including green, brown and red. Which other building versions are made that you know? 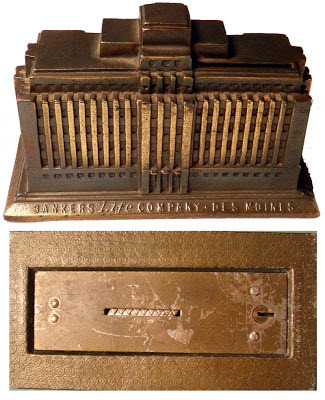 There are indeed three Bankers Life models and I have them all. One is a smaller size but otherwise identical. I have one. 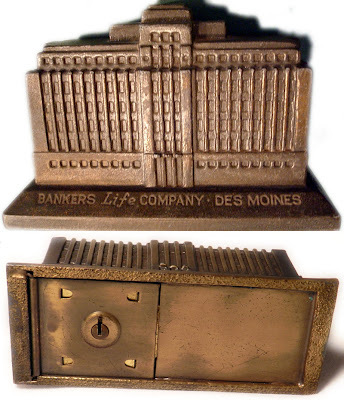 It has the round coin lock on the bottom.